The Department of Natural Resources (CDNR) was created in 2001 and is responsible for ensuring the quality of the district's 7,300 acres of land. Through enhanced landscape management, staff training and constant high quality maintenance, the department is quickly becoming the benchmark by which many municipal organizations measure the quality of their landscape and gardening. The data below represents the number of trees that were removed District-wide as well as the number of shrubs and trees that were pruned. Customers applying for a Building permit will create a web-based on-line Building permit application. 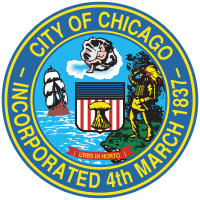 As part of an initial review within the Building permit process, the zoning plan examination will be conducted to ensure compliance with the City of Chicago’s Zoning Ordinance which regulates land use. The applicant is able to schedule and be seen by a zoning plan examiner on average within two (2) business days from the date of the on-line application. An applicant may receive zoning approval within the first scheduled appointment if they have followed the instructions and do not require administrative relief for their project. If administrative relief or corrections are required, the applicant can re-submit the application for immediate review and approval upon completion of the corrections or administrative process. An applicant typically requires two plan review visits before the Department of Housing and Economic Development is able to approve the zoning part of the building permit. The Small Business Improvement Fund (SBIF) program uses Tax Increment Financing (TIF) revenues to help owners of commercial and industrial properties within specific TIF districts to repair or remodel their facilities for their own business or on behalf of tenants. Spending is counted in the month in which the project was completed. The Map Chicago Website allows users to view neighborhoods, communities, political boundaries and points of interest throughout the city of Chicago. The percentage of the Map Chicago website uptime, the amount of time the site was available, and the target uptime for each week are available by mousing over columns. The target availability for this site is 99.5%. The Security Department ensures the safety and security of patrons, employees and facilities in Chicago’s Parks. The data that is displayed below represents the total number of security checks that staff made during the previous week. The Office of the Comptroller consists of four divisions that provide financial services to the Parks: General Accounting, Accounts Payable, Accounts Receivable, Payroll and Quality Control. The data displayed below is in relation to the Accounts Payable division and represents the percentage of invoices that are paid to vendors within 60 days of invoice data. With a goal of reviewing landmark permits in one-day, the department strives to meet this goal no less than 95% of the time. The Historic Preservation Division staffs the Commission on Chicago Landmarks and reviews all permit applications for work involving designated and proposed Chicago landmarks and landmark districts. The Zoning Map website is an interactive mapping site that allows users to determine the zoning classification for any area of the City. The percentage of the Zoning map website uptime, the amount of time the site was available, and the target uptime for each week are available by mousing over columns. The target availability for this site is 99.5%. A Bed and Breakfast License is required to rent out rooms in a home to overnight guests, and to provide a breakfast meal. Currently the performance target for processing Bed and Breakfast Licenses is 15 days. The Department of Natural Resources (CDNR) was created in 2001 and is responsible for ensuring the quality of the district's 7,300 acres of land. Through enhanced landscape management, staff training and constant high quality maintenance, the department is quickly becoming the benchmark by which many municipal organizations measure the quality of their landscape and gardening. The Department also manages the contract that the Park District uses for garbage and recycling pick-ups. The data displayed below represents the monthly gross recycling tonnage that is collected compared to 2010. Limited Business Licenses (LBLs) are required for all Chicago businesses not specifically exempt from licensing requirements. This includes all business that provide services, or engage in office operations or general sales. Currently the performance target for processing Limited Business Licenses is 3 days. This metric tracks the number of congregate and home delivered meals provided to seniors per month. DFSS, Senior Services division is the city’s Area Agency on Aging for older adults. DFSS offers a wide variety of programs and services that address the diverse needs and interests of older adults in Chicago from those who are healthy and active to those who are frail and homebound. The Congregate Dining Program strengthens social relationships while addressing the problem of poor nutrition among older adults. Each day Senior Services provides seniors with opportunities for nutritious meals, socialization, recreation, education and volunteer activities through approximately 60 co-sponsored congregate dining sites which annually serve over 20,000 senior residents. DFSS also provides over 11,000 frail homebound older adults with hot home delivered meals five days a week. The 311 website allows residents to submit service requests or check the status of existing requests online. The percentage of 311 website uptime, the amount of time the site was available, and the target uptime for each week are available by mousing over columns. The target availability for this site is 99.5%.